The goddess Durga is a fierce yet compassionate warrior. She embodies invincible courage, bravery in the midst of uncertainty and that loving but no-nonsense support of the mother. 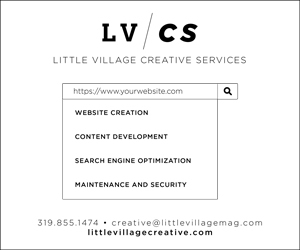 Sometimes in our lives, we feel less-than, weak or disenfranchised. In these moments, our practice should empower us, build our reservoir of resiliency and stoke the fire of passion and spirit that dwells within. The practice is best done early in the day, and on an empty stomach. Feel free to add some other movements as you transition between poses; however, let your breath be at the forefront of the practice. After the twist, take yourself through Knees-to-Chest and Savasana for a minimum of five minutes. Close with a short meditation as described. Chanting is one of the fastest ways to shift your mood. By chanting this mantra, you create a force of invincibility around you — protecting you from what you don’t want and sealing in what you do want. Stand in Tadasana with your palms at your heart. Inhale slowly to take your arms out to your side. As you exhale, chant the mantra and bring the palms together at the heart. Do five rounds, and aim to deepen and lengthen your inhale each round. Expand the space around your heart and feel the great scope of Durga around you. From Tadasana, step your left foot back about four feet. Your feet should be hip-distance apart and parallel. Stay on the ball of the back foot. Take your arms out to the side and make gentle fists with your hands. Inhale here, and as you exhale, bend into the front knee so that the right thigh is parallel to the floor and the back knee almost touches the floor. Inhale the leg back to straight. Repeat a total of five times, and then do five rounds on the left. Uddiyana Bandha should not be performed if pregnant or trying to conceive, during the menstrual cycle or if you have a hernia. Stand with the feet parallel and bend the knees. 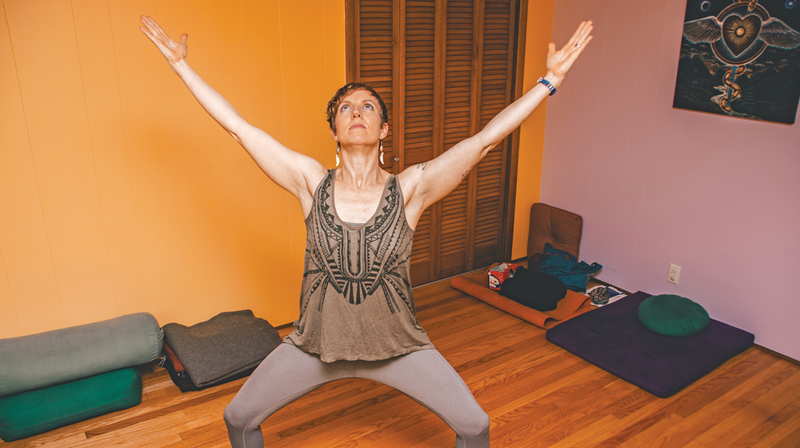 Place your hands above your knees and keep the elbows straight. Inhale deeply and arch the spine, and as you exhale, draw the tailbone into the body and feel the pelvic floor lift. Hold your breath out, and scoop that abdomen toward the back body — like you’re taking an ice cream scoop to the belly. Keep the chin tucked. When you need to inhale, soften your belly and take a smooth breath in. Repeat 3-6 times. Separate the feet 3-4 feet wide. Turn your toes out. Bend into your knees. Inhale, sweep your arms up into a V and look up. Hold the breath in for a moment and mentally repeat the mantra. As you exhale, chant the mantra out loud and pull Durga energy — strength and power — into your navel as you look down at the navel center. Repeat four times. Straighten the legs and take a moment to observe. Then, repeat the sequence, but this time, take hands to the heart as you exhale — and feel the force of invincibility landing home in your heart. Lie down on your belly and place your hands by the side chest. Inhale and press the hands into the mat, moving into a gentle Cobra Pose, and exhale to come down. Repeat this three times, lifting higher each time. Then, inhale and press into Cobra Pose and stay — low, medium or high cobra. Be sure the shoulders are not shrugging up, and the elbows are in toward the body. Stay for 3-5 breaths, chanting the mantra as you exhale, sending the mantra straight into your heart. Rest on the belly when done. Flip over to your back, take the arms into a T and draw the knees in toward you. On an exhale, drop the knees over to the right. Stay here 5-8 breaths. Repeat on the other side. Follow with knees to chest, Apanasana and Savasana. 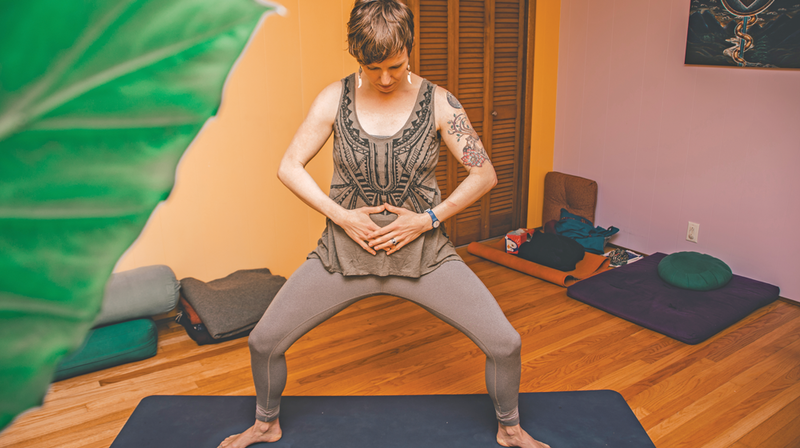 Sitting upright, take a moment to feel the strength and length in your spine — the core of your body. Inhale deeply, with ujjayi breath, and exhale to chant the mantra. Repeat this 3-9 times. Once finished chanting, rest in stillness for as long as you like, aware of the residual vibration of the mantra and meditating on Sva Rupa — the essence of your True Self — vibrant, awake and empowered. 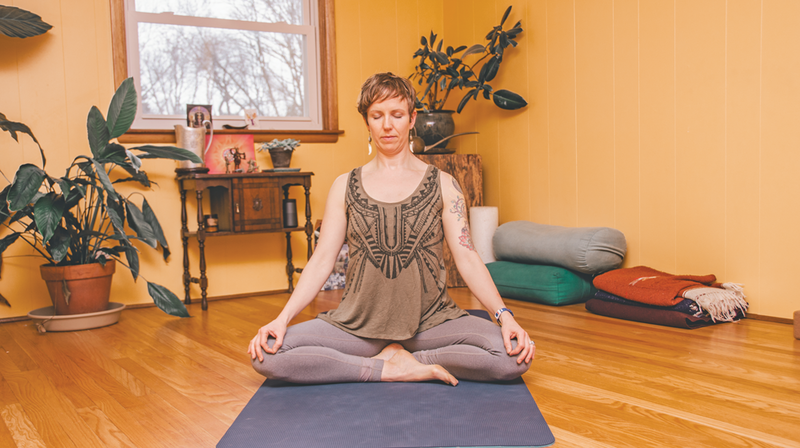 Fannie Hungerford is a yoga and meditation teacher based in Iowa City. 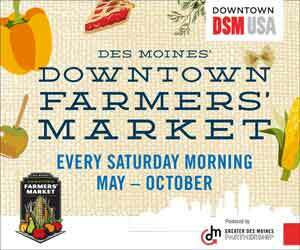 She is Iowa’s only ParaYoga certified teacher, and is committed to sharing tools for living a more vital and fulfilling life. Find out more at www.fanniehungerford.com. 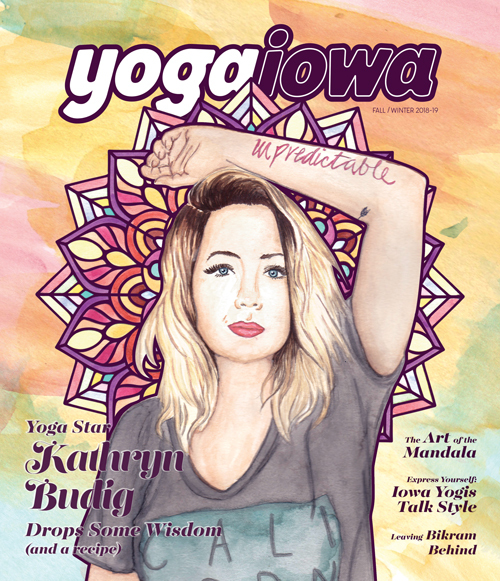 This article was originally published in YogaIowa’s Spring 2018 issue.